Photo: Sherman Pallen, Cyndi Pallen and Phil Russell. A documentary following Tla’amin’s Hɛhɛwšɩn canoe project made its debut during the Powell River Film Festival in mid-February. Hɛhɛwšɩn – The Way Forward follows the process of carving an eight-metre dugout canoe on a Powell River beach during several months in late 2017. The film was directed by Tla’amin member Cyndi Pallen (čɩnɛ) and edited by Theo Angell. It was co-produced by Tla’amin Elder John Louie (yaχwum) and non-Indigenous friend Phil Russell (kʷʊnanəm). Pallen, Louie and Russell were the ones who came up with the idea for a reconciliation canoe, an idea that builds on years of work that was already being done within Tla’amin to heal from residential schools. With support from Tla’amin leadership, the initiative was named Hɛhɛwšɩn, meaning “the way forward,” to represent a better future for Indigenous and non-Indigenous people living alongside each other. While the canoe was being carved on Willingdon Beach in a process being led by skilled Tla-o-qui-aht canoe builder Joe Martin, members of the public were invited to stop and participate in the process. Hundreds of schoolchildren visited to watch, participate and hear stories. Hɛhɛwšɩn – The Way Forward was debuted at the Patricia Theatre in Powell River on Feb. 16 and 17. After the Feb. 17 screening, a short panel discussion took place involving several people who were involved in the Hɛhɛwšɩn project and film. Sherman Pallen, an artist who lives at Tla’amin and took part in carving the canoe, said that process was not only valuable to educate non-Indigenous people, but it brought knowledge to the nation as well. “It was quite an honour for Joe Martin to come over to show us his knowledge,” he said. The Hɛhɛwšɩn initiative has since grown to include the carving of a second, smaller, canoe and a committee continues to plan events in the community. The Hɛhɛwšɩn canoe will be utilized during the Tribal Canoe Journey to Lummi this summer and an Awaken the Canoes event at Klahoose in May. 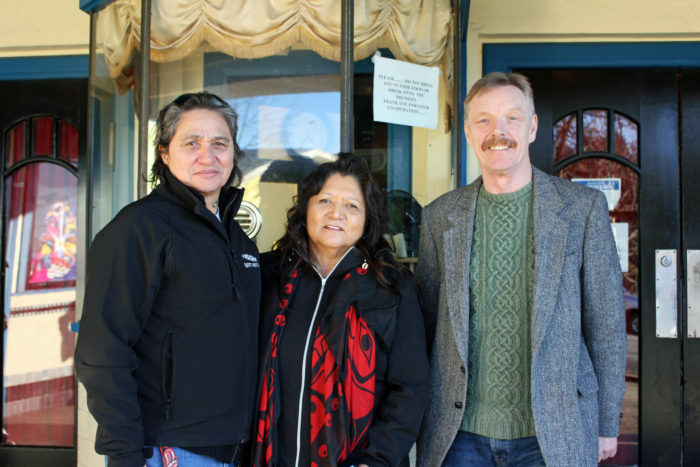 Tla’amin is also set to host Tribal Journeys in 2021, something that will undoubtedly draw in the wider community in Powell River as dozens of canoes from around the Salish Sea are expected to land in the area. Russell said that the Hɛhɛwšɩn – The Way Forward documentary will be screened again for the Tla’amin community, with details to come soon.